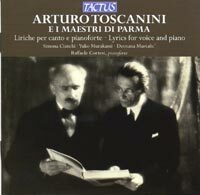 ARTURO TOSCANINI (1867-1957): Spes ultima dea, Son gelosa, Fior di siepe, Desolazione, Nevrosi, Canto di Mignon, Autunno, Berceuse for Piano, GUSTAVO CAMPANINI (1879-1962): Amami, Tu sei partita, GIOVANNI BOTTESINI (1821-1889): La nostra canzone, GIUSTO DACCI (1840-1915): Eco dolorosa, Il tuo riso, La tradita morente, ILDEBRANDO PIZZETTI (1880-1968): I pastori, La vita fugge e non s'arresta un' ora, Quel rosignuol che sì soave piange, Levommi il mio pensier in parte ov' era. Description: Eight of Toscanini's 21 early songs and one of his only other instrumental pieces are coupled here with three songs by his composition teacher (Dacci) and three other composers - all from Parma and performed by members of that city's Conservatory. Stylistically everything here is indebted to the prevailing mid-19th century aesthetic of sentimental romanticism with harmonic influences of the German lied mixed with the melodic traits of the Italian chamber aria of, say, Donizetti and Tosti. Italian-English texts. Simona Cianchi, Yuko Morakami, Dzenana Mustafic (sopranos), Raffaele Cortesi (piano).